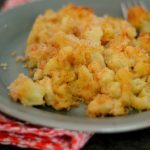 Grandma Jennie’s Macaroni and Cheese –comfort food at it’s finest. This is really one of our family favorites. I always double the recipe! Preheat oven to 375 degrees and prepare an 8 X 8 casserole pan. Cook macaroni noodles in salted water until a bit al dente. Drain and set aside. In a saucepan, melt butter and flour, creating a roux. Mix in the milk and simmer until it starts to thicken. Add the cheese and stir until it melts together. Pour into casserole pan and sprinkle with smoked paprika and panko. Bake for about an hour until bubbly and browned near the edges. Double or triple the recipe to feed a crowd or to have leftovers. Want to add ham? Add a cup of cubed smoked ham before you pour into the casserole dish.